Fuerza Regia Monterrey (LNBP) landed 28-year old American power forward Alex Oriakhi (208-119kg-90, college: Connecticut). He started the season at Bigua in Uruguayan LUB league. In 10 games he averaged 6.6ppg, 4.5rpg and 1.7bpg this season. 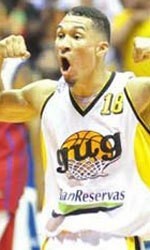 The last summer Oriakhi played at Vaqueros in Puerto Rican BSN where in 12 games he had 8.3ppg and 6.3rpg. In 2013 he was drafted by Phoenix Suns (NBA) in second round (57th overall). Oriakhi attended University of Connecticut and it is his fifth season in pro basketball. Among other achievements he played in the final of Venezuelan LPB in 2016. Oriakhi received also Eurobasket.com Lithuanian LKL All-Imports Team award back in 2015. He is a very experienced player. And here thanks to pro basketball Oriakhi experienced life in eight different countries playing on three different continents. He is familiar with European, Latin American and of course North American leagues. Oriakhi has played previously professionally in France, Israel (Hapoel Holon), Italy (Betaland Cdo), Turkey (Socar Petkim), NBA G League (Sioux Falls Skyforce and Erie Bay Hawks), Mexico (Aaguacateros), Lithuania (P.Zvaigzdes) and Venezuela (Bucaneros).